Just posted a new article on NetMagazine: the developer’s guide to browser adoption rates. It analyzes the speed of adoption of new browser versions and compare them to each other, and to the Flash Player plugin adoption. Much like my old Flash video playback benchmark, this is one of those things that started with an assumption that I wanted to investigate further (in this case, “browser updates take much longer than Flash Player updates”) but that ended up with unexpected results that made me look at things from a different perspective. The takeout of all of it is that while the adoption rate of new Flash Player versions is pretty good (and getting better), browser update rates are getting better too, and Google Chrome is leading the pack, with a user adoption rate that is even faster than Flash, overall (and the frequency of updates released has nothing to do with it). It means new HTML features are making it out to user’s computers faster than ever, with the exception of IE, which continues to hold the platform in the past. There’s more to it, of course, as it’s a lengthy article (but one with pretty charts to look at). 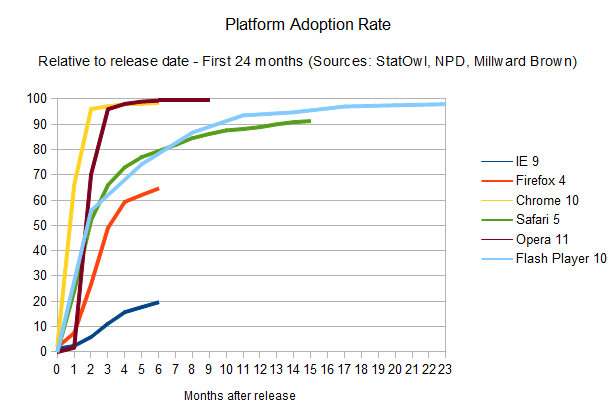 So for the full story, continue on to the developer’s guide to browser adoption rates.